This article is going to be really controversial. It’s really hard to determine the best familiar because everyone is looking for something different. My list is going to try and track the Familiars that I believe are universally awesome. Do you disagree with my list? Good. Begin a rant in the comments below! Please note that I have a guide on which Familiar buildings to get. My recommendation is to only get 2 gyms and to work on two Familiars at a time. This is an evolving article. More Familiars are joining the list next week. So far I’m in the middle of breaking down the Familiars in Pact 2A. Pro Tip: My general advice when it comes to familiars is to get to Pact 3 as soon as possible. Research like crazy and then focus on Pact 3. While you’re waiting, you may as well focus on the right pacts in Pact 1 and Pact 2. I rank the Territe as 8/10. I strongly recommend bringing this Familiar to a Level 60 Elder. The 20% merging skill boost is a no-brainer. It will help with all the rest of the Familiar work that you’ll want to do. Nether Quake: At Level 10 the Territe can generate between 5 and 30 Fragments every 24-hours. This is activated by pressing the “Familiar Button” at the right of the screen. The sooner you max out this familiar, the better. This familiar’s skill will help you greatly with the rest of the Familiars. I know some people will say that the Territe is a waste of time and is not even near as good as the pact 3-4 Familiars. They are right! But, for a Pact 1A, and for the price of a Pact 1A, the Territe is straight-up awesome! I rank the Oakroot as 2/10. The Oakroot looks like an old man at the end of a very long day! He’s trying to get home quickly, but his shoulders are hurting too much. It’s a little depressing. The graphics are also depressing. I think this was designed by someone with less than 2 days of experience in CAD. 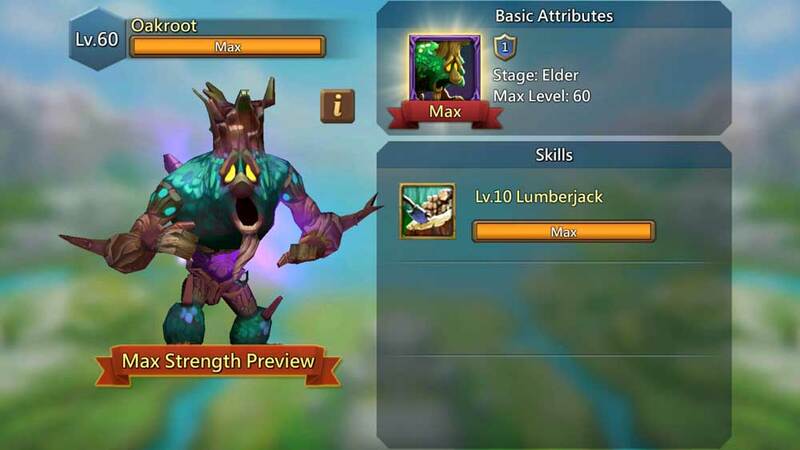 If you are farming or focusing on wood, I’d recommend focusing on the Oakroot Familiar. Otherwise, don’t bother. I rank the Magmalord at 2/10. I’ve been staring at the Magmalord for too long. I still can’t work out where the mouth is. It’s really bothering me. I need to know how he eats. Does he insert his morning cereal into his eyes? I think about these things. I really need to know the answer! If you have seen a real Magmalord (and if you saw him while he was eating), please let me know! 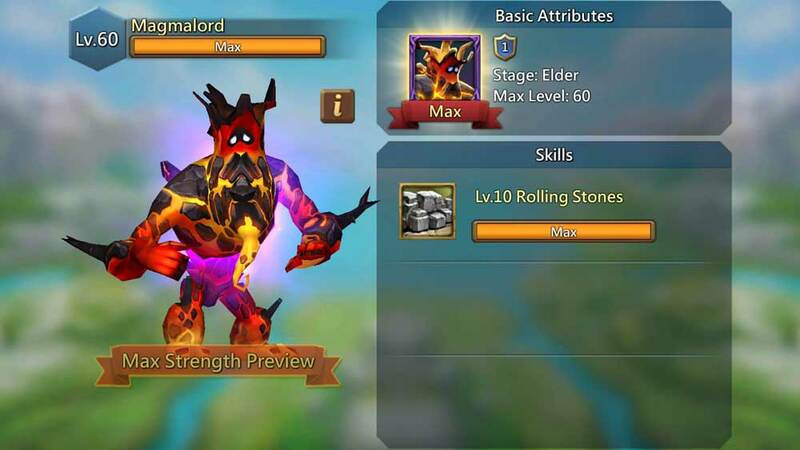 The Mamalord is a waste of time unless you hyper-farm stone. I do. And so I maxed him up really early. If you don’t, don’t get him. He’s a waste of time! I rank the engineer at 2.5/10. Yes. 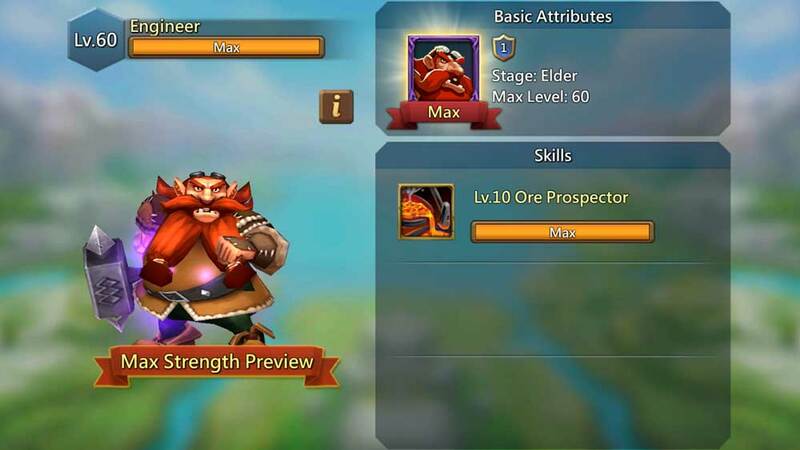 Gimli from Lords of the Rings has finally arrived at Lords Mobile. He’s wearing glasses, but I guess wearing a helmet gets tiring after a while. Like all the recourse Familiars, the Engineer is a waste of time unless you want to focus your production on ore. I gave the score a little higher just because ore is worth a little more than food, stone or wood. But in truth, he’s equally useless. I rank the engineer at 1/10. I don’t know what this thing is! Seriously, someone needs to tell this to stop doing whatever it is doing. Please stop?! And also, why does it have pointy shoes? That’s what bothers me the most! What is even underneath those shoes? A pointy foot? AHHHHH! This is scary! The Jaziek is kinda useless. 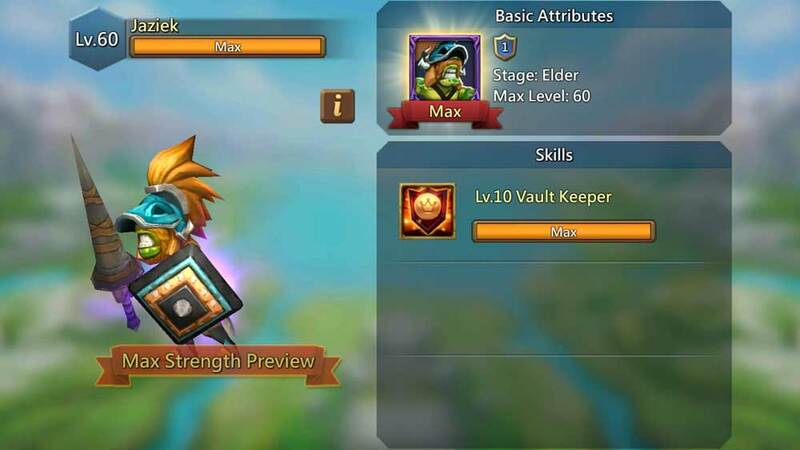 Vault Keeper: At Level 10 the Jaziek gives a 10% boost to the Vault Storage. The Familiars in Pact 1B, like 1A, are primarily useless. The Aquiris is incredible. The rest are as helpful as a fish that can write. I rank the Aquiris as a 8.5/10. If the Aquiris was part of the graphics of the original Doom I would have still been disappointed. To see such bad graphics on Lords Mobile is a bit of a disappointment… I mean, look at those hands. The animator was smoking something really strong! The Aquiris’s skill, however, makes up for the lazy animations and artistry. He’s good. He’s really good! 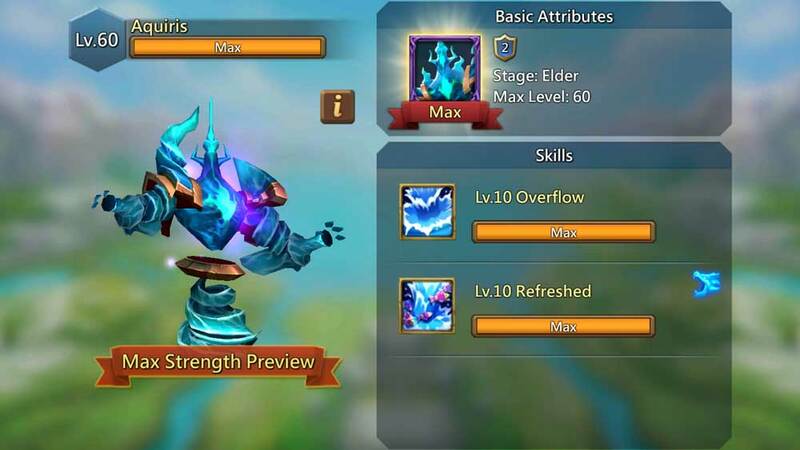 Overflow: At level 10, the Aquiris produces a 40% Anima Production boost. That is nothing to frown at. Refreshed: You can get between 60 – 120 STA every 12 hours by pushing the “Familiar Button”. The second skill of the Aquiris is awesome. In fact, this one skill (combined with the fact that Aquiris is much cheaper than pact 3 and pact 4) may make it one of the best Familiars. This advantage will enable you to get a lot more STA’s, which will let you power up your heroes. The Aquiris is the only familiar that I would truly consider getting from Pact 1B. The Gnome (which gives a gold boost) is a good idea once you’ve got the rest of the Familiars on my list. 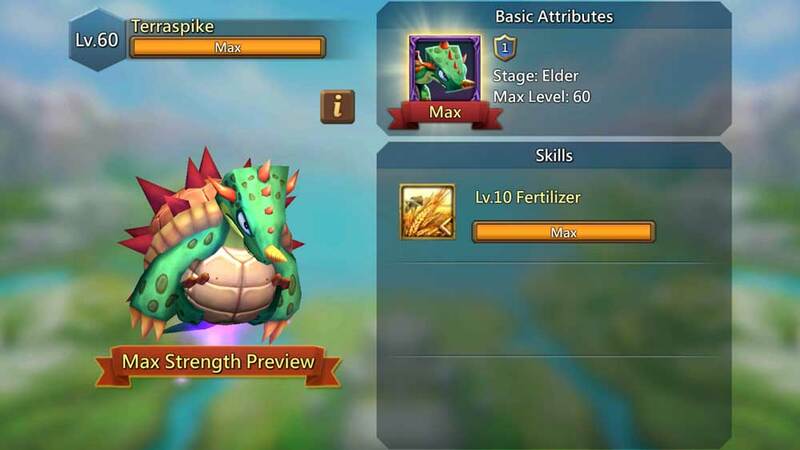 I rank the Terraspike -3/10. Yes, that’s not a typo. I’ve actually given him minus points for being so useless! Even his name is stupid. I wish I had a club so that I could chase it around the yard. His skill is called “Fertilizer”. Enough said. If you don’t have any soldiers and you hate playing the game properly, the Terraspike is the ultimate Familiar. Otherwise, get a life a leave him alone! I rank the Gnome as a 5/10. His graphics are not dreadful. He looks like a Gnome and he moves around in a non-drunkard way. That’s a lot more than what can be said about some of the other Familiars. 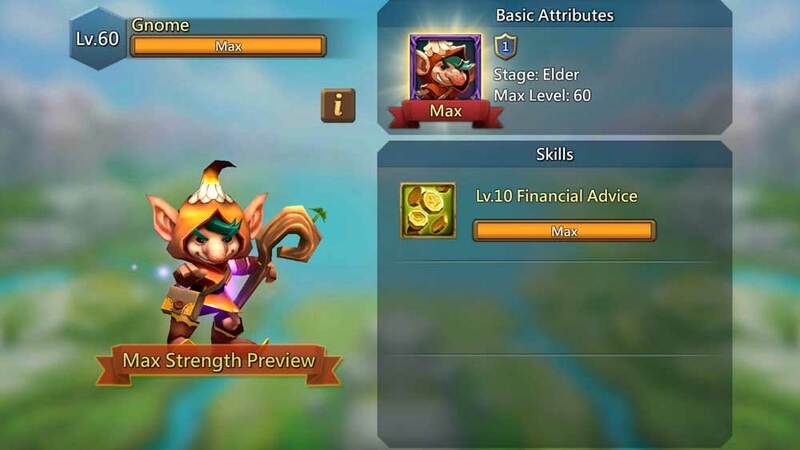 Financial Advice: At Level 10, the Gnome will generate a 25% Gold Production boost. I rank this Familiar as 2/10. The Beastmaster is literally the same graphics as Engineer. They changed a few minor details and then gave him a different name. He looks like Gimli with a little more age to him. His skill is like the type of skill a toddler brings to a talent show. It’s something like, “I can draw my name with ink on my nose” or “I can stack Lego blocks while using slices of bread as gloves”. 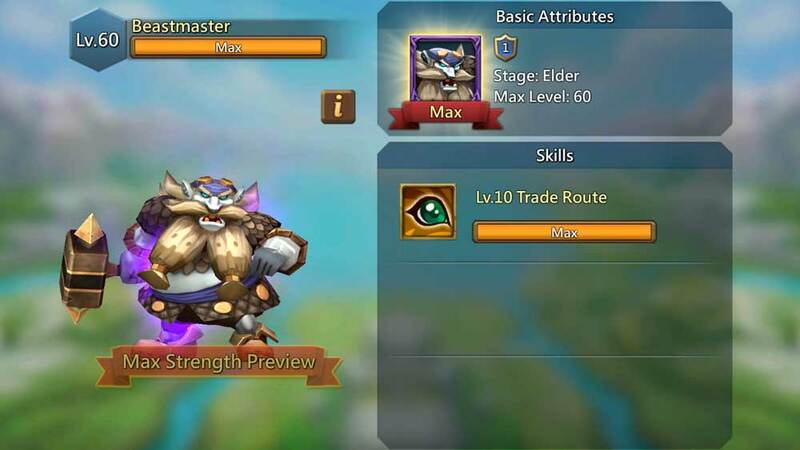 Trade Route: At Level 10, the Beastmaster can enable the Supply Troops to Travel 25% faster. With a name like Beastmaster, you’d expect him to add an army boost of 50% of something. Just saying! The Yeti is as useless as he looks. 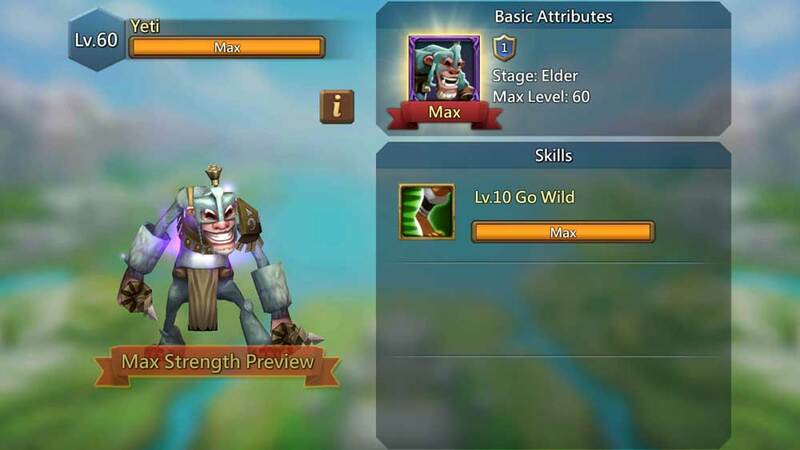 Go Wild: At Level 10, the Yeri boost the Gathering Troops Travel Speed by 25%. And thankfully we have now finished off with Pact 1A and 1B. Good riddance! The Pact 2A selection finally has something that is worth looking at. Not everything is amazing, but at least it is not puke-worthy. The other advantage of Pact 2A are the Fragments. Instead of 1 fragment being generated in each pact, you can either get 2, 3, or 4 in each pact. It adds up! I rank the Tempestite as 6/10. He (or she) is good! Not incredible, but good! The Tempestite also has lazy graphics. It basically looks like Aquiris but it has a face and a little more gray swirls on its body… I guess its supposed to be the wind? It’s confusing, I guess. This familiar comes with 3 skills, and is, in fact, the only Pact 2A familiar that has 3 skills. I would strongly recommend focusing on the Tempestite. His 3rd skill is awesome! You can build a serious army of lower-level troops! Aero Guard: At Level 10, you will get a Wall DEF of 20%. Bleh. Second Wind: At Level 10, he has an Energy Regain Speed of 10%. That’s a nice bonus! 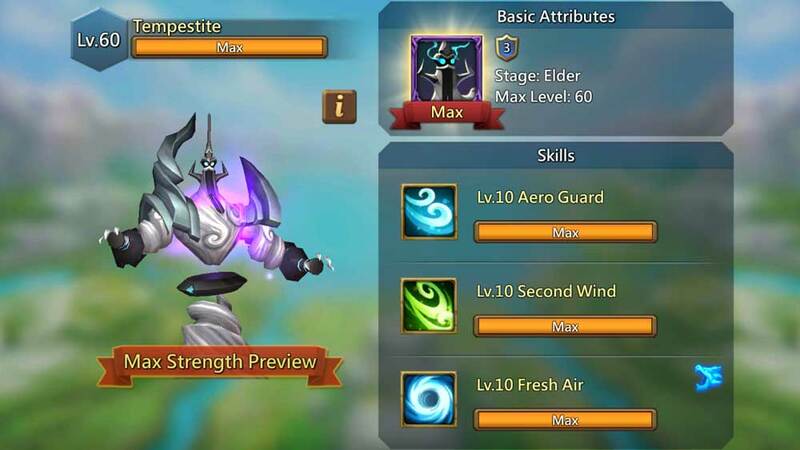 Fresh Air: At Level 10, The Tempestite will generate 20,000 random Tier 1 soldier every 3 days. That’s awesome! I rank the Evil Weevil as a 2/10. The Evil Weevil looks like he really doesn’t want to be in this game. I don’t blame him. If looked like that, I’d also be bored with my life. Do you remember how I said that Level 2 Familiars are great? Well, I most certainly didn’t mean all of them. Some are mediocre. Some are even worse! The Evil Weevil isn’t bad, per se, it’s just isn’t very good! 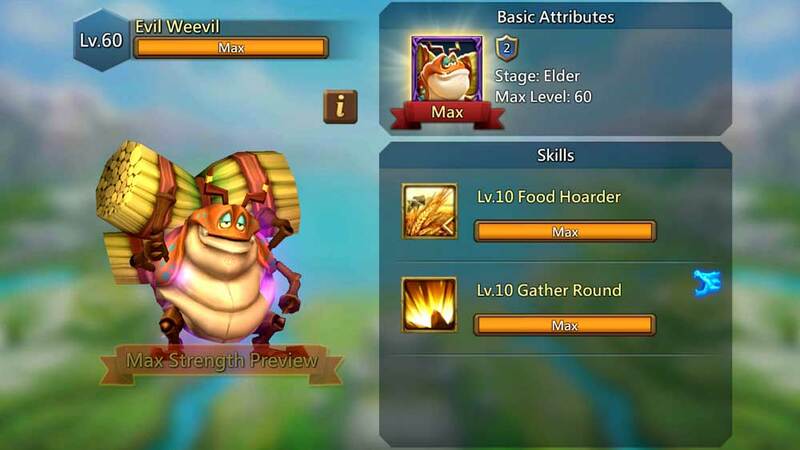 Food Hoarder: At Level 10, the Evil Weevil can produce a Food Production boost of 35%. Bleh! Gather Round: At Level. the Evil Weevil will enable you to generate 4-hours worth of resources every 24-hours. It is important to note that this boost will generate based on your recourse production stats. If you have lots of stone buildings, you will get a lot more stone when you click the Familiar Button. I rank this Familiar as 5/10. The first skill is dreadful, but the second one is pretty good! This thing is straight-up weird and creepy. The Totempest is truly a pest! 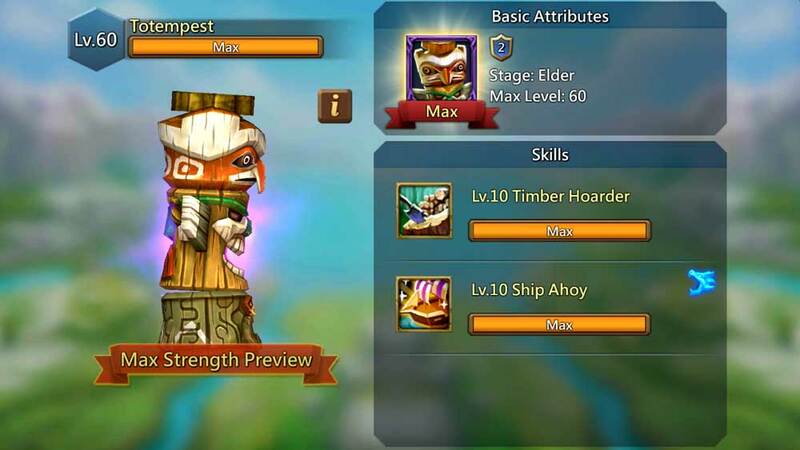 Ship Ahoy: At Level 10, this Familiar will enable you to refresh the Cargo Ship every 24-hours. I rank the Strix as a 6/10. Strix, the familiar who lost all her clothes and apparently has no form of shame. Go figure. I’ve never understood why the graphic artists have to be so obvious. Seriously. Get a room! It is a little much. I’m trying to play a game over here. Both of Strix’s skills are great. Not the best, but definitely fantastic. I wouldn’t max her up first, but I most certainly will focus on her before I go for any of the recourse boost skill familiars. Blood Bag: At Level 10, the Strix will boost the Infirmary Healing Speed by 25%. If you are a war player, this will help a lot! 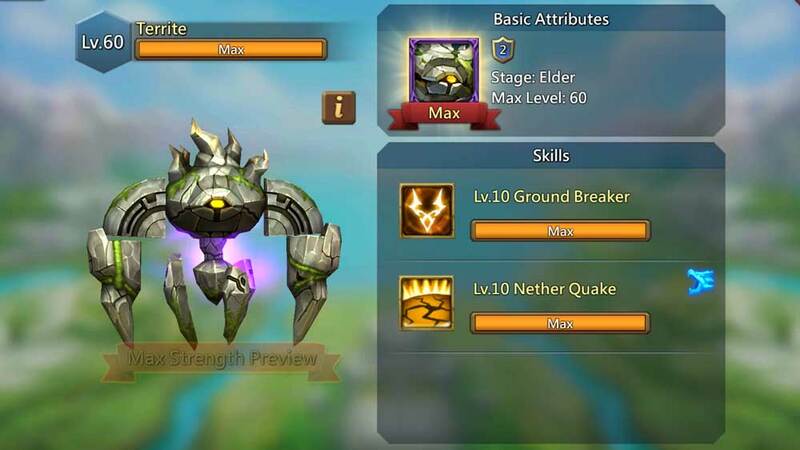 Quick Fix: At Level 10, the Strix will Reduce Execution wait time by 6 hours! The first skill is an infirmary boost. For those who play the game properly, healing troops is one of the most infuriating tasks. Strix’s skills really help. Have you ever filled your jail, but waited forever to finally be able to kill your prisoners. Strix will chop a nice chunk of execution time when she is maxed to level 60. I rank the Sorcerer as 4/10. He has a nifty transmutation skill, but it’s not near as cool as the other Familiar’s skills. The Sorcerer looks like he’s sleeping. Even when he’s powering up in the animation, his eyes are still closed. Seriously. Either wake up or go play another game. Just saying. Also, he has no feet. That’s weird. Please, Sir, put your feet back on. Dark Magic: At Level 10, you can instantly complete an ongoing transmutation every 24-hours. This Dark Magic skill is quite useful. Pact 2B has some serious Familiars. Think of how important breakfast is! Are you thinking about it? Well, triple that importance level! That is how serious the Pact 2B is. I rank the Pyris as 4/10. I know that the Pyris is supposed to be on fire (or magma) but I’m just not buying it. It looks as eloquent as a 3-year old’s peanut butter sandwich. The graphics are worse than a Blaze from Minecraft. This Familiar has 3 skills. The first 2 aren’t anything special, but the 3rd skill is awesome and requires skillstones! 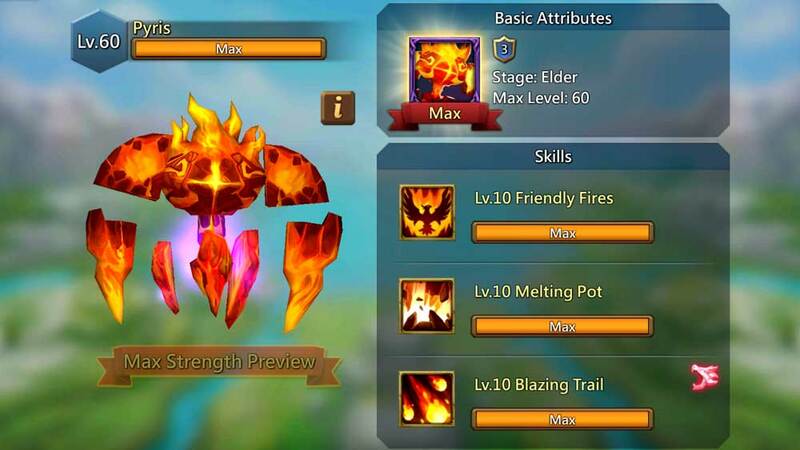 Melting Pot: At Level 10, the Pryis will reduce transmutation time by 10%. Whatever. I rank the Bouldur as 7/10 for beginner players but 2/10 for advanced players. The Construction Skill is incredible if you’re building up the buildings, but useless if you’re buildings are basically all finished! 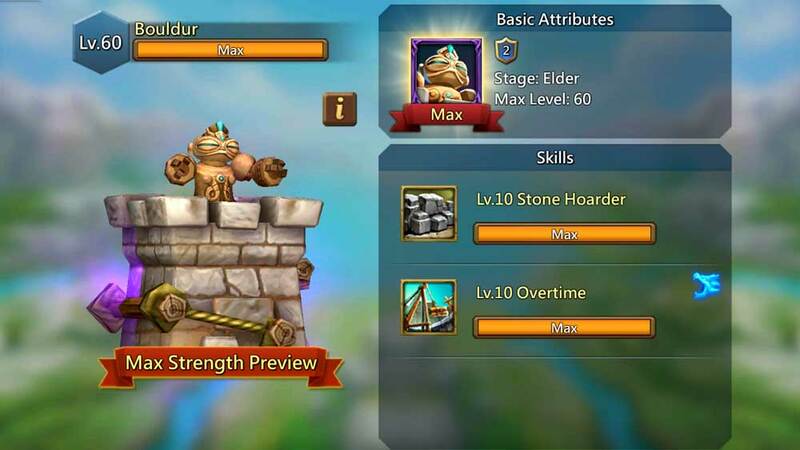 Overtime: When at Level 10, the Bouldur will enable you to press the “Familiar Button” and instantly complete all the “Helps” in the Construction Help Bar. This is incredible if you want to finish a lot of buildings in one shot! I rank this Familiar as a 2/10 for advanced players, but a 4/10 for beginner players. The Krabby looks like a crap. Hence the name Krabby. I would expect this from Sesame Street. Whatever. He’s a strong crab because he’s carrying a package (made of ore) that’s double his size. Apparently, he likes to dance. Ore Hoarder: At full growth, the Krabby that boost Ore Production by 35%. Rocky Resolve: At level 10, the Krabby will boost Player EXP (experience) by 10%. 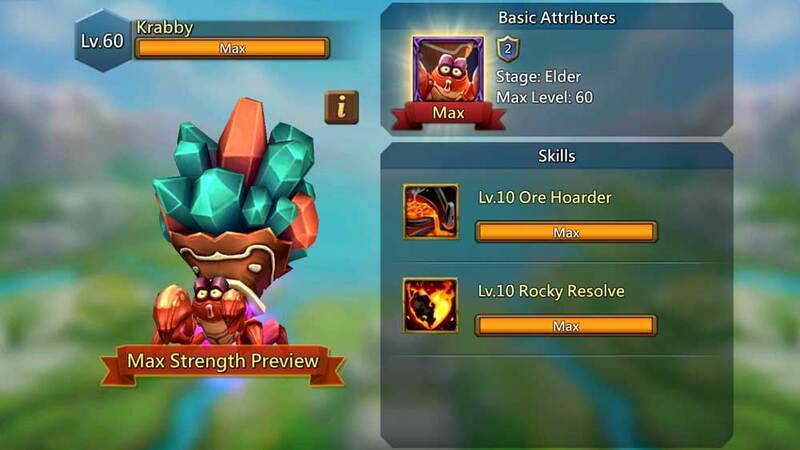 The Rocky Resolve is nice for beginner players who are still trying to hit maximum Player EXP. Advanced players, however, have no need for this boost at all. I rank the Bonehead Familiar as a 7.5/10. He’s really good, especially for advanced colosseum players! I know that the Bonehead has a dent in his head, I still think that the sword is more efficient when carried at waist level. Imagine that someone wanted to attack him. It would take an extra 1-2 seconds for him to reach up and grab the sword from his skull. I’m very disappointed with Bonehead’s life choice. Just saying. In regards to his skills… He’s one awesome hero! Animated: At full strength, Bonehead will store 20% more anima. This is really helpful as you start to unlocked larger Familiars! 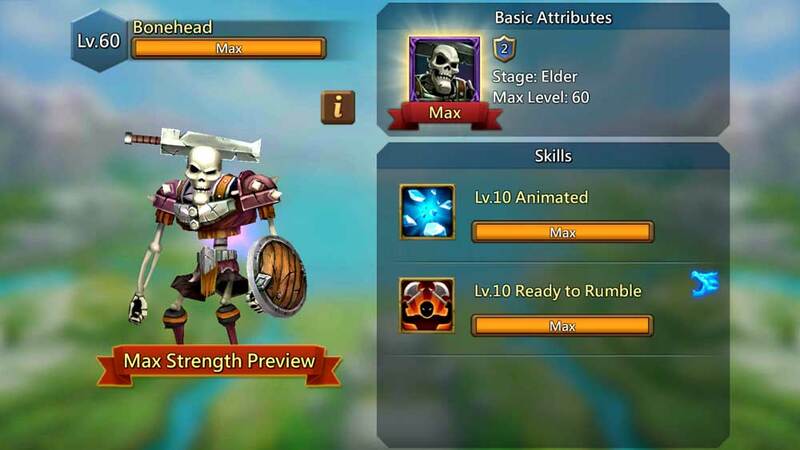 Ready to Rumble: When maxed to Level 10, Bonehead will give you 10 bonus colosseum entries every 24-hours. The Ready to Rumble skill is straight-up awesome! Consider this your golden-ticket to owning the Colosseum. 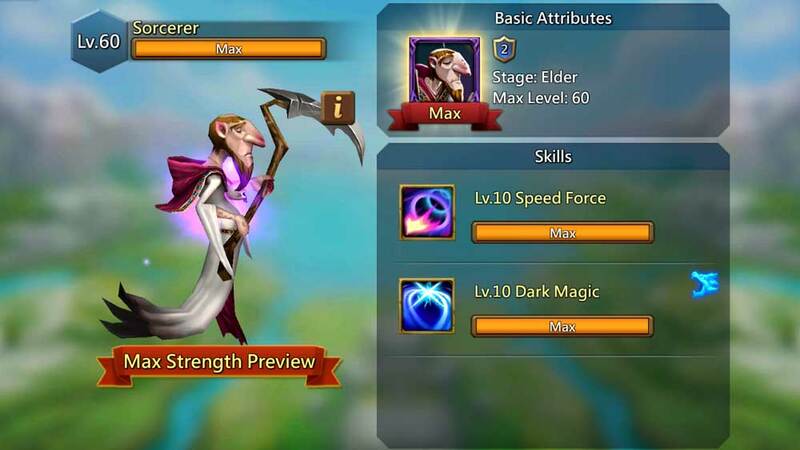 I would strongly recommend maxing this hero as soon as possible! I rank the Harpy as a 6.5/10. She’s a fantastic hero, especially for lower might players (under 200m) who use the shelter all the time! The Harpy has a lot of confidence. I’ll grant her that. Clothes? Not so much… Like the Strix, she doesn’t have much decency. When it comes to skills, she is a solid Familiar with very practical and needed bonuses. Cloud Cover: At full strength, the Harpy will add another 50,000 spots to the shelter. 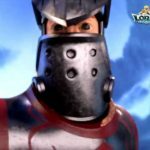 This is very useful for those who are constantly protecting their troops from the big-bully players. To learn more about shielding your troops, click here. 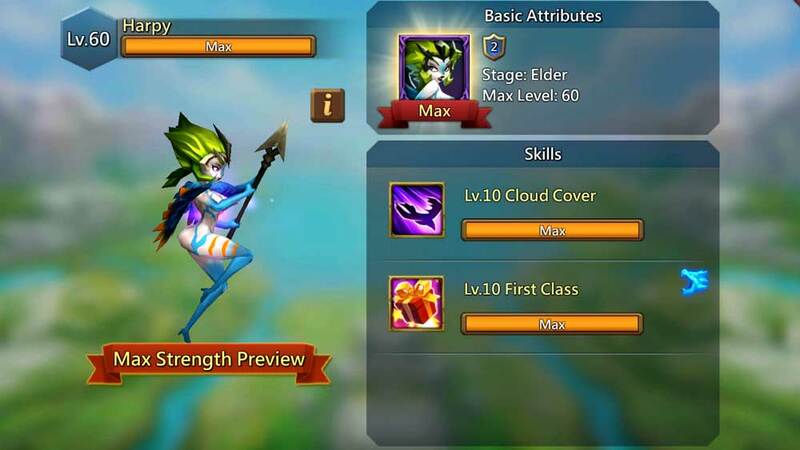 First Class: At full strength, the Harpy will grand 3 random VIP points boxes every 24-hours. This is also a fantastic asset. It can really add up. The higher the VIP level, the more powerful your castle will end up becoming. Pact 3 is where the Familiars get really serious. Until now, the Familiars, for the most part, have cute skills. In Pact 3 and on, the Familiars are powerful! Some of the Familiar Skills can be used as warfare. I rank the Gryphon as 7.8/10. It is a great Familiar but there are other Pact 3 Familiars that are far better! Those who have been hiding under a rock will not recognize this monster. Everyone else will recognize the Gryphon as one of the weirdly contrived Monsters sprinkled around the Kingdom. Yes, it’s a lion and eagle… Not original, but at least not terrible! Air Support: At Elder Level, the Gryphon will increase the Max Allied Army Size by 50,000. This is a massive skill! 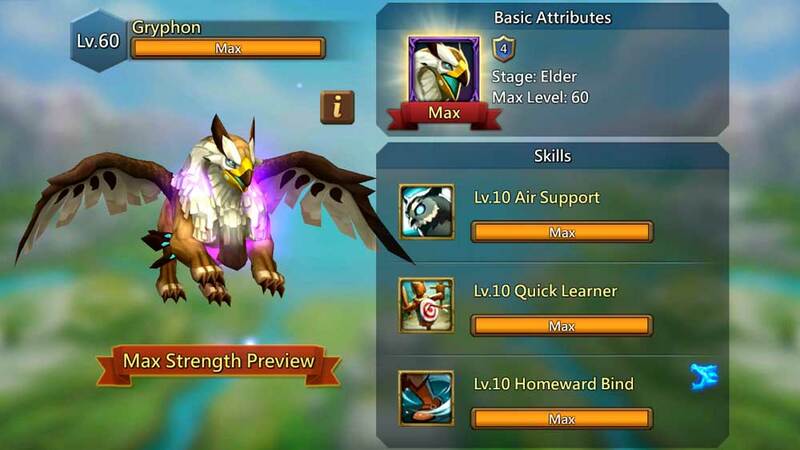 Quick Learner: At max level, the Gryphon will advance the troop training by 5%. That doesn’t sound like much, but it is quite good! Homeward Bind: When totally maxed, the Gryphon will recall all troops back to the castle within 6 seconds. This is an incredible skill to have during war. You will need to use Skillstones to activate! All in all, the Gryphon is a solid Familiar! 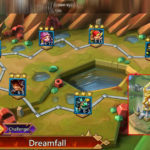 If you were looking for advice on how to beat the Gryphon Monster Hunt, click here. I rank the Noceros as 8.2/10. This Familiar is powerful! IGG’s laziness in reusing yet another monster can be forgiven when you understand how awesome this familiar is. My theory is that the monster got drunk and gave away too much. Look at its eyes, it’s definitely drunk! Beast of Burden: At full strength, the Noceros offers an additional 35% army capacity! In a Flash: At full strength, the Noceros will automatically finish 5 gathering troops recourse collecting on the spot every 24 hours. This is an incredible skill! 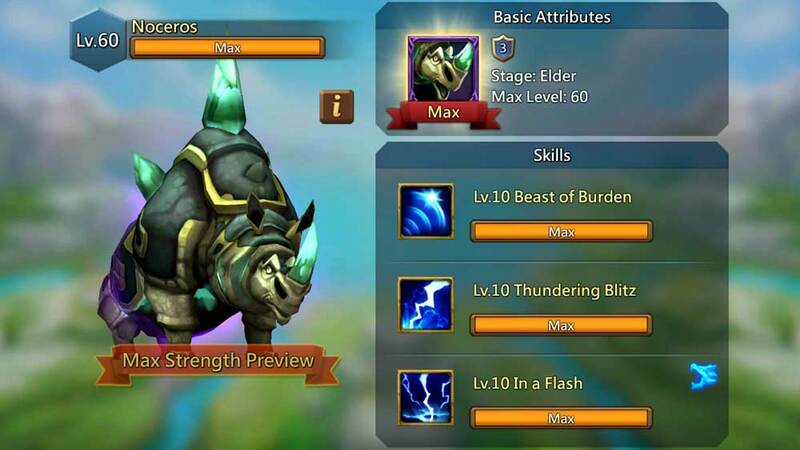 Click here if you wanted more information on how to beat the Noceros Monster Hunt. 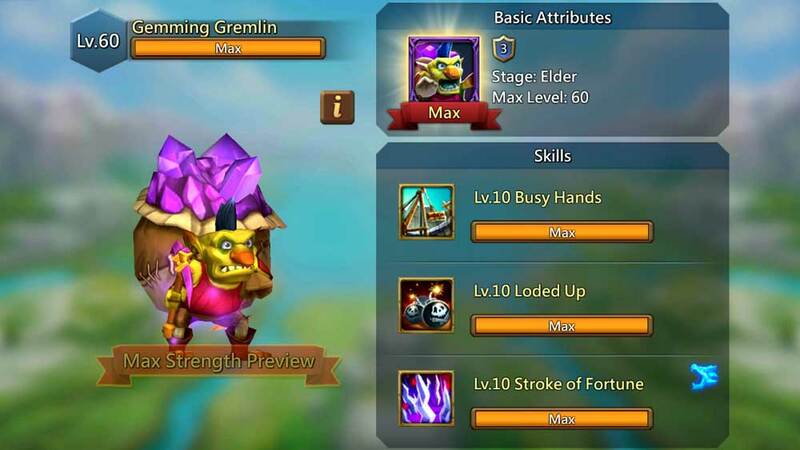 I rank the Gemming Gremlin as 8.7/10. This is the third best Pact 3 Familiar without a doubt! You’ve seen this weird guy in the Labyrinth and he’s annoyed you beyond belief. Now is his time to finally help you out (without tempting you to potential win 1,000,000 gems)! The first two skills are nice, but not great. The third skill is wonderful! Stroke of Fortune: Generates 1,000 – 2,000 gems every 2 days. Really, really amazing! 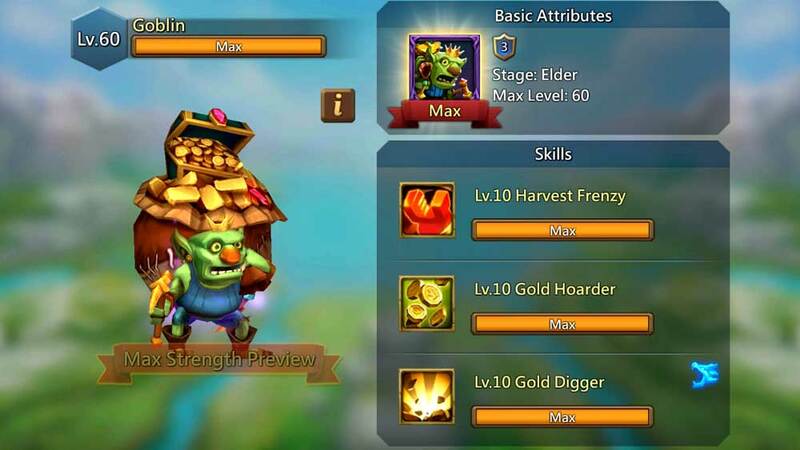 I rank the Goblin as 9.5/10. This Familiar is a gangster! If you are an advanced player and go through Gold like beer at a frat party, you will love this Familiar. The Goblin looks like a Goblin and so no problems there. The graphics aren’t dreadful. Yay IGG. Harvest Frenzy: Increases Gathering Speed by 25%. Really good! Gold Hoarder: Increase Gold Production by 35%. Awesome! Gold Digger: Generate 6,000,000 – 12,000,000 gold every 24-hours! Insane! This is my favorite Familiar in Pact 3! Note all the exclamation marks!! I rank the Trickstar as a 6.5/10. There are so many disturbing things about the Trickstar. I’m not sure where to start. The belt, arrow, redness, and the eyes are all equally distressing. My opinions on the Labyrinth are strong. You can read it on my Labyrinth article. Even though I don’t recommend investing in the Labyrinth to win the jackpot, I do think that playing is still a great decision. The Trickstar is, therefore, an awesome Familiar. Astal Assistance: Ranged ATK of 10%. Great! 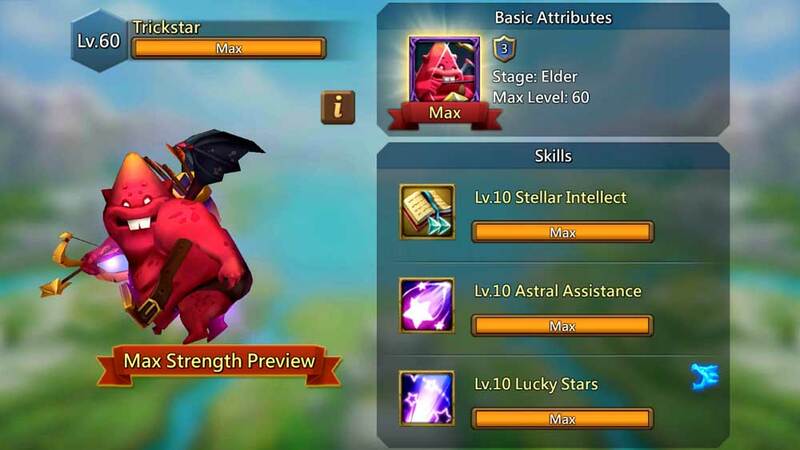 Lucky Star: Grants 3 random Holy Stars Items every 2-days. Awesome! All in all, the Trickstar is really good but I wouldn’t focus on him until you finish off the better Familiars! The Magus is a solid Familiar and I rank it 8.5/10. If imitation is a form of flattery, the Sorcerer should be thrilled. This Magus character is basically identical bar a few details… Either there is a terrific backstory or lazy graphic artists. Do you want to give a guess? 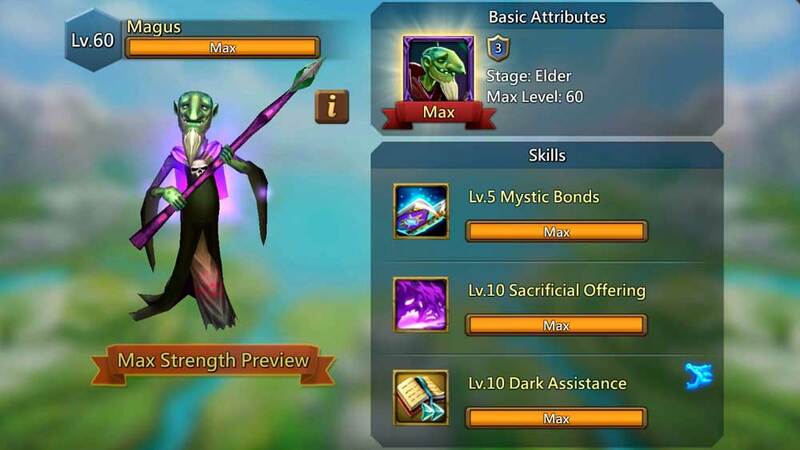 Mystic Bonds: At full strength, the Magus will add another 5 pacts to the Spire. Awesome Skill! 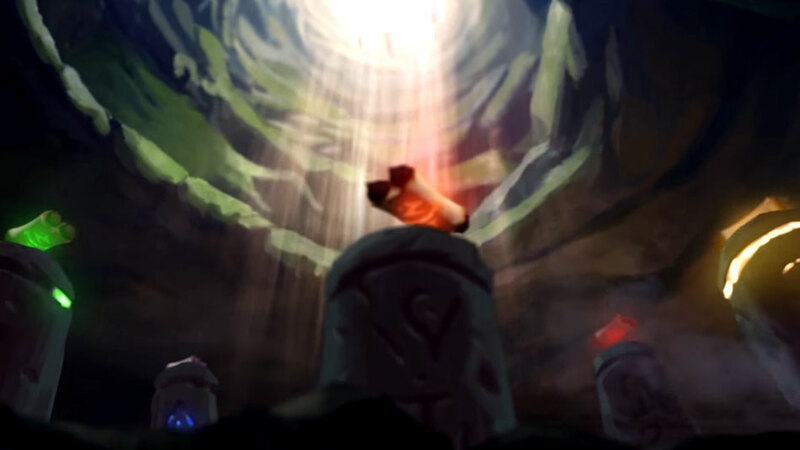 Sacrificial Offering: At full strength, the Magus will add 6 hours to the Altar Duration. Nice! Dark Assistance: Fulls up the Help Bar for research. This is a fantastic skill if you need to finish a Research for Hell Events and Guild Fest! 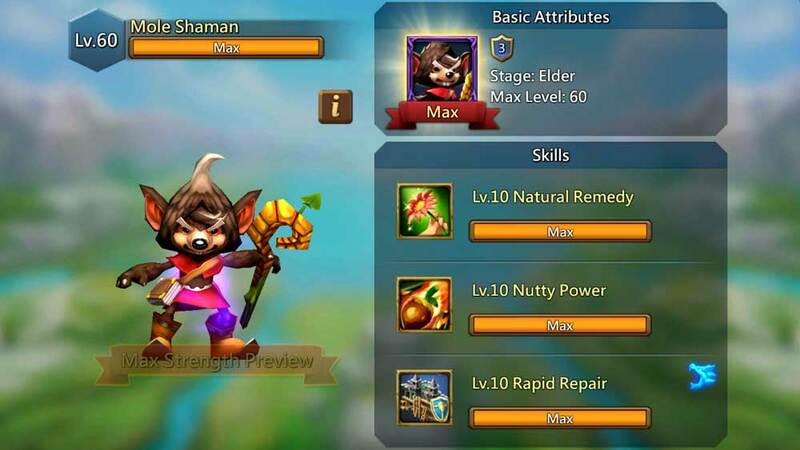 I rank the Mole Shaman as a 7/10. Fantastic Familiar! Yes, these are those pesky monsters that drive you crazy in the hero challenges. They self-heal just as you are about to kill them! The good news is that they are now on your side!